The sequel to the successful relaunch of the Doom series is coming, and it's going bigger than its predecessor. Bethesda has done a great job of bringing back some of their most iconic franchises over the last few years. After reviving Wolfenstein, they successfully brought back the granddaddy of all FPS games with a fresh reboot of Doom that helped breathe new life into a title that had a hard time making the jump to modern FPS styles over the decades. Now that Doom finally has the flagship relaunch it needed, it's time for a sequel. And fans will be getting their new sequel in the form of Doom Eternal. During Bethesda's annual E3 press conference the company showed a teaser trailer that featured many of the iconic enemies from the series, including the minotaur-like cyber-demon and the giant spider-brains with a mounted laser. The trailer's backdrop was that of a desecrated metropolitan city overcome by necrotic tentacles and debris. The teaser ended with a shot of Doom Slayer, AKA "Doomguy" putting on his iconic green helmet before jumping into the action. After the trailer was shown, two dev team members came out to give a few more details about what fans can expect from Doom Eternal. The devs promised a more powerful Doomslayer and twice as many demon types for players to destroy. Hell on Earth was, of course, promised as well. 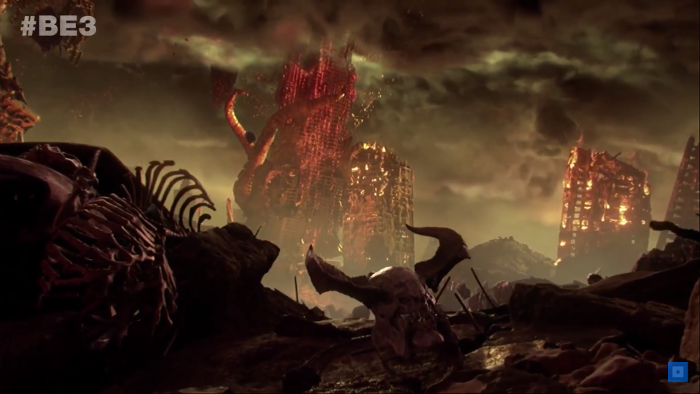 However, beyond those sparse trinkets, not much more information was forthcoming other than the fact that they will be revealing more detailed information on Doom Eternal this August at the annual Quake Con event in Texas. At least there's only about a two month wait until we get more info.